This exercise is to build on collage skills which I previously explored in Part 1 of the course. However, the focus is to be on the exploration and presentation of colour and composition. I initially took a picture of a corner in my studio. Using this photograph as a reference I created three collage studies, that capture its colour and composition. The second collage was to be an unusual colour combination. I chose a mix of very vibrant colours for this and a palette I would not usually choose. The third collage was required to have a complex colour combination. Complexity suggested to me, a wider range of colours and detail. I chose the unusual colour combination to make three further collages as I wanted to use the simple shapes I had picked out in it. I had some really nice black and white patterned papers and decided to use them to complete a monochromatic study. I chose to work with a range of blues for the single colour study. As I am blue-green colour blind I thought this might present a challenge for me. I hope I managed to effectively represent the tonal values of the original collage. The third version required us to be bold and adventurous using a large number of different colours and papers. The aim of this exercise is to help us gain an understanding of opacitities of colour through observation and recording of transparent and semi-transparent objects. To do this I collected a range of empty glass jars and a vase and presented them as a small still-life display. I then created a series of striped palettes based on the colours I could see within the glassware with watercolour crayons as I did not have watercolour paints with the colours I needed. I’m not sure I did this entirely successfully as looking back on the requirements for this exercise I feel I created more of a colour palette rather than a striped interpretation of the still life. Re-reading the exercise I don’t think I correctly represented the proportions. This is an exercise I may need to repeat especially if the striped designs are required for future projects. This exercise aims to help you work on ways of interpreting colour and colour proportions from an image and to present these as a yarn wrap. I chose ‘Supper at Emmaus’ by Caravaggio as my Old Masters painting. I found it quite difficult to buy a good quality postcard size of the image and in the end chose to purchase an A3 print from the National Galleries website. Finding yarns, ribbons, threads and lace that fitted with the colours was more difficult than I expected. Modern colours have a brightness to them which didn’t accurately convey the colours of the painting. I mainly used embroidery threads, some leather, ribbon and wool. I made three wraps by using card mount and wrapping the materials around it. The wraps are supposed to convey the colour scheme from horizontal, vertical and the centre of the painting. I found this exercise to be interesting and challenging. It certainly increased my appreciation of the painting as I studied the play of light and shadows within it. The colour matching went fairly well and I hope I made a good representation of the colours within the painting. This allows you to build colour palettes digitally by selecting from a colour wheel or using an image to pick out colours from. I experimented with this app by using a photographed image of my Old Master’s painting ‘Supper at Emmaus’ by Michelangelo Merisi da Caravaggio. I created these three palettes from isolating sections of the painting. You are restricted to five colours per palette which is probably better if you are creating a logo or branding but not so useful if you are looking at a painting. I wasn’t that impressed in terms of interpreting the palette of the painting. It wouldn’t pick up the turquoise blue of the vase or the necktie and several of the colours don’t look like the same shade. However I can see the value of this app if you were trying to create a palette to choose colour for a design. It allows you to use a slider to alter the brightness and values of the colour allowing you to personalise the palette. It also gives you the levels which would be useful for printing purposes. The colour wheel lets you create a palette based on single colour by choosing themes. I think this app could be useful as a starting point to create some ideas or if you were creating digitally printed textiles. This software isn’t available as an app but you can use it directly from the web. It allows you to generate colour gradients, colour palettes and colour blindness tests, which I found amusing. I failed colour blindness tests before and through this app and a little further research I have discovered I have tritanopia and apparently this is quite rare about 1 in 30-50,000 people and generally only 8% of men and 0.5% of women have a colour vision defiiciency! Rather than tests it indicates the colour scheme which someone with the different types of colour blindness would see, which made me think mine must be a mild form of it. So this software allows you to choose a colour and then form colour palettes based on it such as complementary, neutral, split complementary, tetradic etc. It only chooses colour that have the same saturation and brightness though so while giving some varied palettes they lack depth and tone which would make an artwork more interesting. An app I tried which was rubbish and didn’t work properly. This is an open collection of colour palettes which can be used as a resource by anyone. An online tool to find and make colour palettes from images. This works very basically choosing random parts of the image. It might be useful if you zoomed in on a section prior to uploading the image. There are no options to change proportions or pick your own palette. An online forum for sharing created palettes and patterns. It allows you to choose images from Flikr but not from your personal image library. It generates six palettes and gives a chart of up to 48 colours from the image. It looks interesting but wasn’t the simplest to use. I had several attempts at finding an image it would import, then couldn’t find the saved palette. I produced it again and screenshot it as I couldn’t find another way of saving it and sharing to WordPress. This looks like an interesting and advanced tool provided you have the time and patience to learn how to use it. An interesting little app where you can either take a photo or choose from your library and it will give you multiple layouts of the colour palettes it produces, you can reproduce Hex codes and save to your own image library for sharing. However recently it is only showing photos from my library which I have used elsewhere online so I’m unsure if a recent IOS update has affected its productivity. You can add up to 11 colours in the palette and display them in varying layouts on the image. It’s fun to use and quite simple, but like the other apps it didn’t pick up the correct shades in the Caravaggio painting. 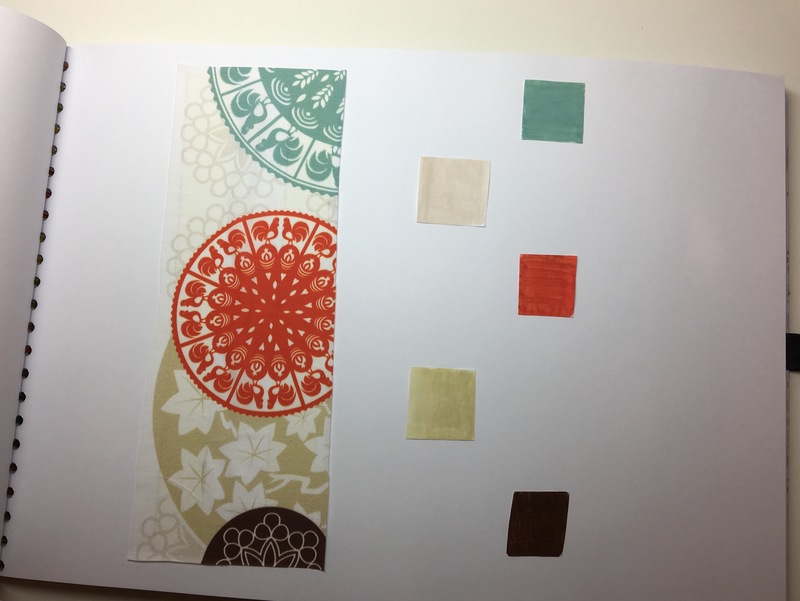 The aim of this exercise is to help me collate, observe and record colour palettes from a series of textiles. 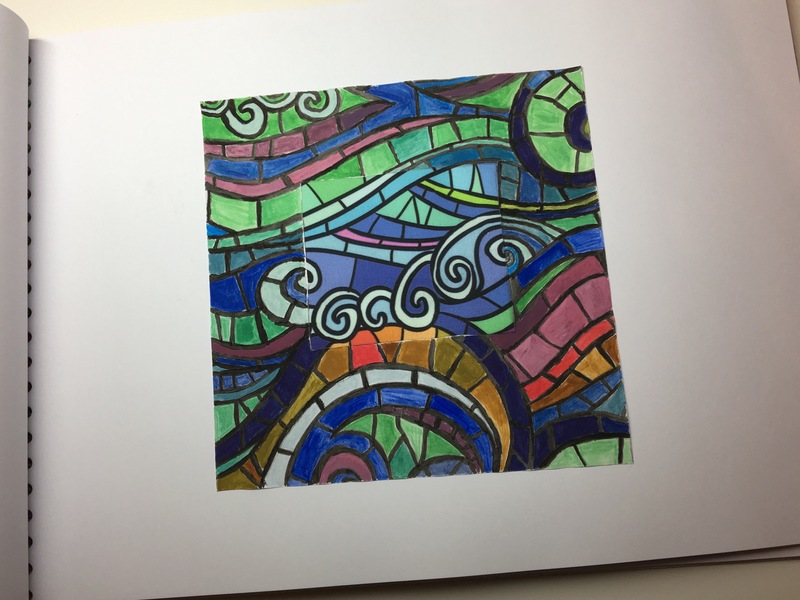 The second part of this exercise required choosing one printed sample and cutting a piece approximately 10cm x 10cm and extending it’s design. Then colour match the design using the gouache paint. I quite enjoyed this part and it was fairly successful but it is very difficult to reproduce the digitally printed colours accurately. This time choosing a neutral sample colour matching and extending the design. 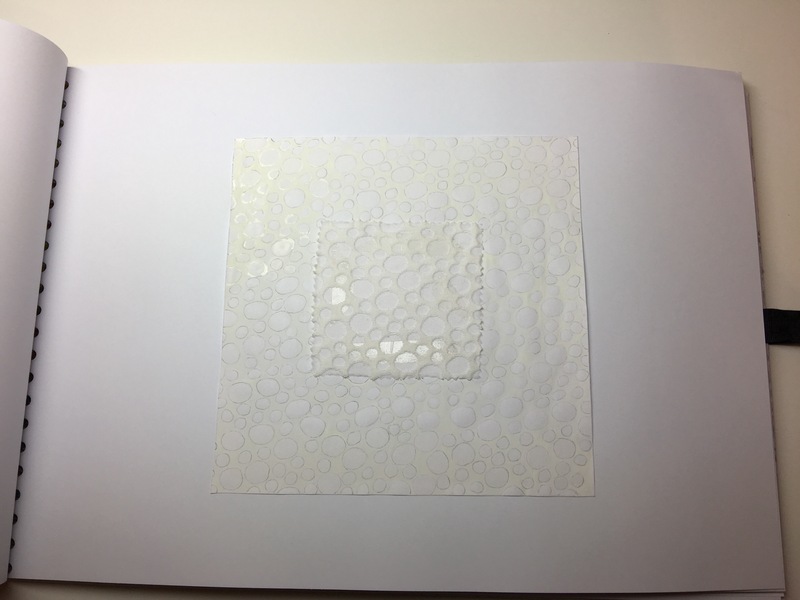 The sample I chose had a creamy white fabric with semi-transparent circles. The circles picked up the white of the background paper and when I initially started painting I was going to use the creamy colour then go back in with the white to pick up the circle design. I quickly realised this wasn’t going to work as the white gouache paint was not the same white as the paper, so I then painstakingly painted between every circle to make the sample work. Part 3 of A Textile Vocabulary is primarily focused on colour mainly through observation, analysis and examination of physical media. Initially we are asked to research the work of some textile artists and designers. The company Voyage Decoration creates soft furnishings and wallpapers etc. They have a number of collections which portray different designs and colour palettes. The company has a signature watercolour look running throughout their work. They have a number of collections each one taking a small palette of colours and mixing it with a specific style of prints. The colour ties to the look of prints for example muted colours with traditional prints and vibrant colours with modern abstract designs or using more traditional prints and modernising the colour scheme by using a variety of shades. This depicts botanical types sketchbook drawn pictures on a background of muted, natural colours. This collection has a much more art and crafts feel, using much more vibrant colours with bold patterns depicting flora and fauna from the British countryside and Scandinavian folk art. The way the colour is used gives the designs a much more modern feel, modern checks and neutral wovens are also featured in this collection complementing the bolder pieces. Taking inspiration from the catwalk this collection continues to draw on influences from the natural world. These are conveyed in modern fluid pieces blending shades of colour with metallic and embroidered sequin embellishments. I particularly liked the Alchemy Lustre Collection. It uses shades of sapphire, amethyst and moonlight and I loved the mix of colour and prints, especially the Galatea print which is a dreamscape of irregular horizontal stripes digitally printed on velvet capturing the original painting. Is a fashion designer who studied architecture before graduating in textile design and fashion. Her graduation show in 2008 which featured trompe l’oeil prints of oversized jewellery on jersey-bonded dresses took the industry by storm and immediately secured a place for her in this field becoming known as “The Queen of Print”. She has had an enormous influence in this medium using digital printing to experiment with print in a way that fine arts and other methods can’t. The complicated prints often take days to create, she uses a very varied and daring mix of colour and pattern. Vibrant, multi-coloured, bold prints. Geometric prints, bold florals and nature-inspired shapes mixed with stripes, polka dots or checks. Her Spring Summer 2018 Collection is inspired by childhood, an idealised view on it but a child’s imagination is the only limit. Her collection is a creation of bold, vibrant colour like a child’s colouring pen collection mixed with shapes, fabrics motifs and designs summoned from remembrance of childhood, she uses digital printing techniques enabling her to engineer a three dimensional quality. The colour and design being interdependent to the desired outcome. This piece was obviously inspired by painting by numbers. 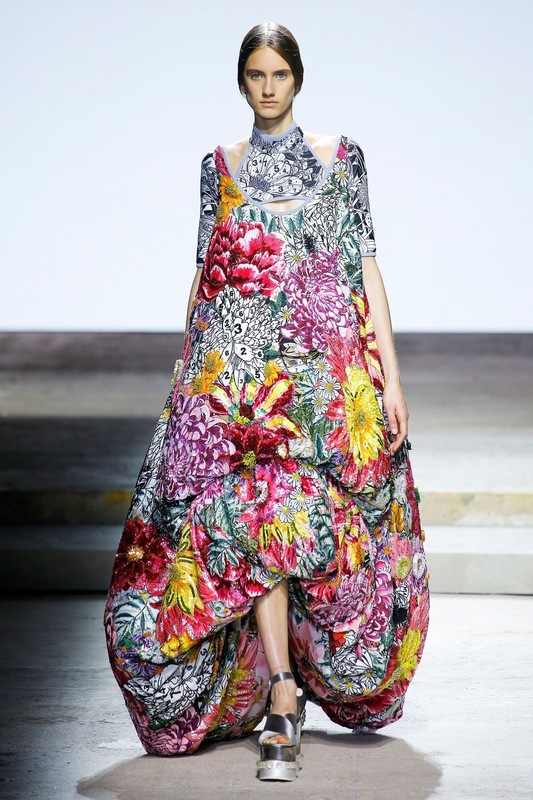 It is a voluminous dress with bold, oversized florals which are coloured brightly with some sections of the design left uncoloured. It is a fun design, not something I would choose to wear, it is a little bold for me! 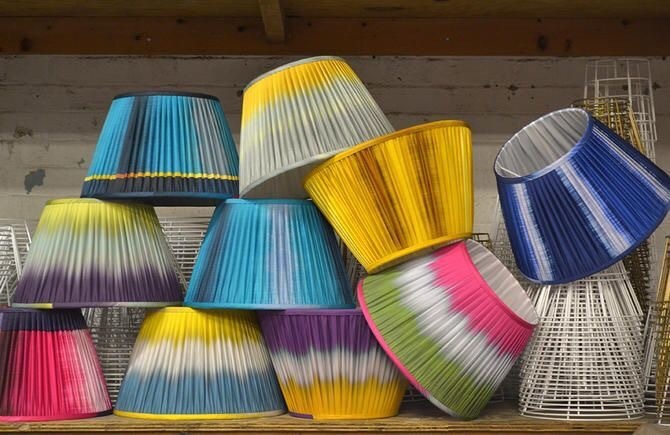 Ptolemy Mann is a contemporary textile artist and designer known for her unique and colourful hand woven artworks and textile designs. She emphasises her work is underpinned by colour theory. Her collection of flat weave rugs explore geometry and colour inspired by the Bauhaus movement. Her signature hand dyed and woven techniques have more recently inspired commercially produced furnishings and her unique approach has brought her craft into the 21st century. She uses her trademark ikat techniques to blur the edges of the vibrant colours in her Copper and Silk light shades, but her ability to branch into more commercial industry is underpinned by her profound understanding of colour interaction.